Books do a lot of things. They entertain. They transport. They comfort. They also teach. In many of the stories we read, there are villains. Characters who do not have our main character’s, or anyone’s, for that matter, best interest in mind. They always have a plot or scheme of some kind, with a hidden motive hidden behind it (whether the story reveals it to us or not). Sometimes, that villain falls from his or her rise to power literally (ouch). Sometimes, they end their reign of terror with a fit of remorse for what they have done. But many times, there is no remorse. There is no Darth Vader-esque redemption at the end of the story. Terrible things happen, and whether that villain is in the end punished for it or not, there are no sincere apologies. They would have gotten away with it, too, if it weren’t for our sole hero or team of day-savers. They are already plotting their escape, even as they are cut off from the outside world they tried to take all for themselves. How is this different than a redemption story? And why bother? We love redemption stories. We love spending a little time believing they happen often. They do happen in real life, and when we hear about them, our hearts are warmed. But we are all also, in one way or another, in tune with the reality that there are people out there who will never apologize. They will never come back to the light side. And for someone who has been on the receiving end of unapologetic evil, that hurts. Sometimes relatable stories are not lighthearted. They don’t make us feel understood in the sense that everything is fine, we aren’t the only ones, the author totally gets us. We feel understood in a much darker way. ‘Oh yes, I know how that feels. That was not a fun time.’ Contrary to what many readers apparently believe (sigh), prompting this kind of emotional response, as an author, is not only okay, but necessary. You have to make them feel things. They can’t always be happy things, nor should they always have to be. Sometimes a relatable story is real in an unexpectedly ‘hits too close to home’ way. Some people need that. While your main character will go through significant changes from the start of your story to the end (let’s at least hope so), your villain might not. That has the potential to make a much better story than you think it does. Not every character has to go through big changes, and the fact that the opposition to your MC does not can actually magnify the significance of the changes your MC experiences. You can make a character round, give them depth, and not award them a revelation. In a way, that’s your way of making peace with the fact that they are awful and don’t deserve a happy ending. Because that is what a redemption story is: a story with a happy element tacked onto its ending, not just for the good guys, but for the bad guy, too. Books do a lot of things. They entertain. They transport. They comfort. They also teach. Even stories of fiction have important lessons threaded into their framework. A book can show someone that not all people are good, without leaving them totally empty and hopeless. As long as you have that changed-for-the-better main character to balance them out. Maybe this is the lesson your MC needed to learn all along: that not everyone will apologize for their wrongdoings. That not everyone turns from bad to good at the end of a story. This has the potential to make them stronger, emotionally. Your readers, too. Just because someone else might never change, doesn’t mean they can’t learn to be a better person, for all the people out there who never will. I love redemption stories. Which is why, sometimes, writing the opposite kind of ending to a character’s story is so much fun. Take an element of a story you love writing, then flip it. That is the best kind of challenge you can give yourself as a writer. Hopefully this background info will help you try it out in your next story. Image courtesy of The Jedi Temple Archives. In a way, then, maybe it is partially up to us – up to you – to pay attention to, to be mindful of, the messages you send in your stories. We have a job, as writers. And that job is to tell stories. One after another after another, each their own, but sometimes with common themes and morals sprinkled throughout. However, the act of telling a story is much more complicated than you might initially perceive. Not the writing itself, not the creativity behind it, but the facts, the truths, woven through it. The foundations from which the plots of all stories are built. A story can be completely fictional but still tell the truth. A bit of truth, one one page here and another there. It’s the way we, writers, frame the story. It’s the lens through which we show our readers the characters, and explain their behavior, if their behavior needs explaining. The framework from which we develop these ideas does come from somewhere. Though it might seem as though ideas appear out of thin air, they all have influences. We have influences. We pick and choose the way those influences shape our opinions and the way we see the world. In a way, then, maybe it is partially up to us – up to you – to pay attention to, to be mindful of, the messages you send in your stories. The way you portray certain cultures, beliefs and populations. Whether or not your stories convey that certain behaviors are wrong, even if they are never punished. Whether or not you communicate that a writer’s job is not necessarily to stand up for something, but to provide the fuel that motivates readers to stand up for themselves. People in general are very quick to blame, and often it isn’t what they blame, but whom. Sometimes writers are targeted because of the way readers respond to their work, when in reality, the blame should never be tossed onto the writer. At least not on the writer alone. How someone responds to a story, that is not the writer’s fault. Writers are messengers. Blame the message. Whether the writer originally meant to convey that particular message or not. Fine. What happens when a writer makes a mistake (which, in case you haven’t realized, happens to every living being on the planet) and sends the wrong message? People get upset, obviously. People blame. People try to make sense of the misinformation. And maybe, in some cases, we’re all better off for it. For there is a lesson in every error. With every word of misinformation comes the opportunity for someone new to be informed. That isn’t to say that we should misinform on purpose: of course not. In fact, there is a way, possibly only one way, to fix misinformation in fiction, and that is, as both a reader and a writer, to first be informed yourself, before informing others. Yes. As a reader and a writer, we have to do work. We have to learn and understand. Which makes our jobs harder, and more time-consuming. But, as I always say: if it were easy, it wouldn’t be worth it, now would it? Image courtesy of Eden, Janine and Jim/flickr.com. It is a storyline that has been recycled time and time again. An unsuspecting main character has always felt “different” from his or her peers. It turns out he or she is not only different, but even more dramatically, “chosen.” The world needs saving, and it’s up to him or her to do it. There’s no choice in the matter. The choosing has already been done. Have you, as a reader, ever craved a realistic story that tells of completely random, ordinary people stepping up to do something amazing without being asked for a change? Maybe not. But it does seem like a nice alternative to the characters who become heroes just because they were apparently destined to be. If you want to try something a little different with your next plot, here are some ways you can keep it exciting and mysterious without a “chosen one” leading the rest of the world to victory. Anything can happen in your story—sometimes though, within reason. 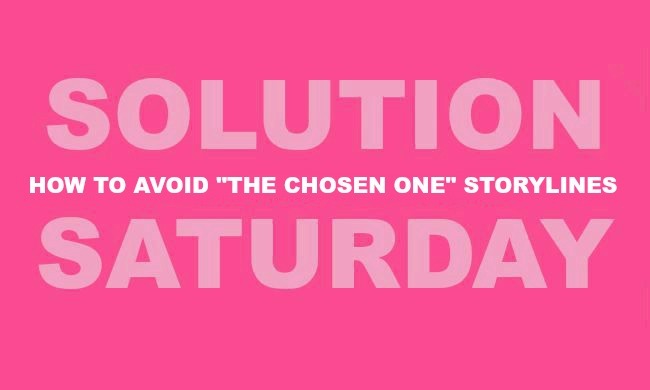 It’s the unexplainable events and circumstances that cause us to lean on plot elements like “chosen one” characters, who are often for some reason the only ones who can solve an ongoing problem. Try making your story as realistic as possible, but keep it moving. Send your characters on an adventure without forcing yourself to use unrealistic elements to move it along. This is just a starting point, to help you practice keeping a storyline moving without unrealistic elements. If you’re writing in the fantasy genre, for example, those elements will always be there. But it’s important to learn not to rely on unexplainable things like magic to craft a decent story before you allow yourself to get comfortable using them wisely. In real life, everyone has different skills, weaknesses and strengths. While one person might be better at one particular skill than another, no person is exceptionally gifted at everything, which puts everyone on an equal playing field with equal chance of failure or success. Apply the same principle to your storyline. Instead of giving one character all the credit, split different worthy skills between a group of characters and have them all contribute to achieving the same goal—one that, ideally, none of them could have achieved alone. A favorite form of info dump in sci-fi, fantasy and adventure stories is the all-knowing character. He or she seems to have all the answers to our main characters’ questions, including how they can conquer their obstacles (or at least give them subtle hints as to how to do so). The best way to avoid this cliché is to make everyone equally clueless, even the third-person narrator. No one knows what the future holds or knew that the events that have occurred would happen before they happened. Leave out talk of prophesies. There will be characters who will know things your MC doesn’t, but even they should, in these circumstances, have limits to their overall spectrum of knowledge. All this being said, there’s nothing wrong with “chosen ones.” We love them, and probably always will. But not every single story needs to have one. Think of The Hunger Games here. In the end, everyone had to work as a team to restore some kind of reasonable order between the districts. Katniss became the Mockingjay later on in the story because of choices she made, not choices made for her. Give “the chosen one” storyline a rest. See what you can do without it before your brain comes up with a story that requires one (which does happen, and that’s okay). You might surprise yourself.